The Government of India has taken a number of initiatives to expand trade opportunities between India and CLMV countries. 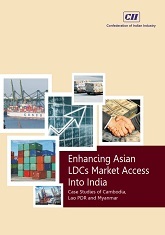 This report focuses on how market access to Asian LDCs can be enhanced in India, for the countries: Kingdom of Cambodia (Cambodia), Lao People’s Democratic Republic (Lao PDR) and Republic of the Union of Myanmar (Myanmar). It provides an overview of economic and bilateral relations, trade trends of Cambodia, Lao LDR and Myanmar, domestic economic and trade policies. It also sheds light on the top items traded between these three countries and India, the connectivity and how trade in services can be enhanced. The purpose of the study is to examine where trade and economic relations between India and the above mentioned countries stand, what are the overall trade trends and how greater trade and economic integration can be facilitated. The report was unveiled at the 5th India – CLMV Business Conclave held from 21-22 May 2018 at Cambodia.